How to set up a submersible aquarium heater? Using a submersible aquarium heater is the easiest way to keep the water temperature in a stable range for the health and happiness of your fish. Setting up the heater in a proper way is also important for the working efficiency and durability of the heater. 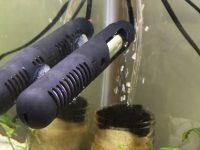 This article will help you know how to set up and position a submersible aquarium heater in your aquarium to make it work with the most efficiency and last for a longer lifetime. 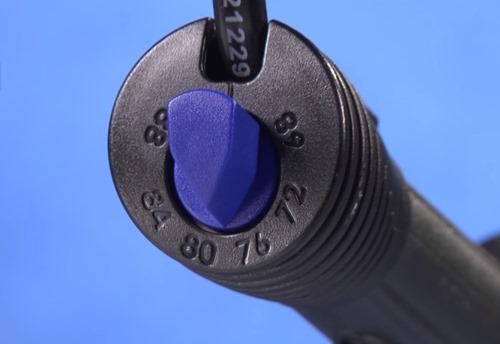 If you use a submersible aquarium heater, you will find a temperature dial control knob on its top that allows you to set the temperature you want. 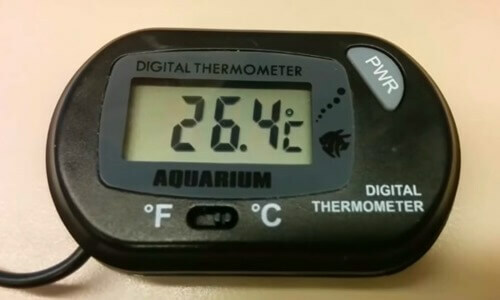 Aquarium heaters are usually set and calibrated for tropical fish and the temperature range they offer is somewhere between 68 F and 88 F.
The setting may not be 100% accurate, but even if it is, you should always have a reliable thermometer to verify the aquarium temperature easily. If you use a non-submersible heater, it must be clipped to the aquarium rim and protected from splashing to prevent water entering the open-topped tube. If your aquarium heater unit is marked submersible, it should be placed entirely under the water. Most aquarium heaters today are submersible. 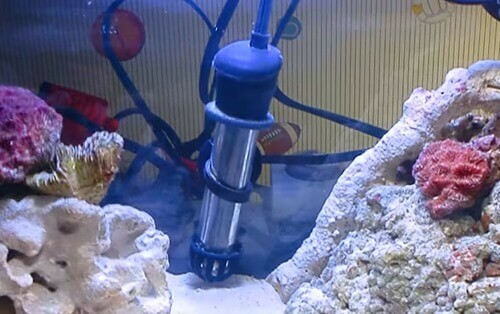 The construction of a submersible aquarium heater only allows it to work properly underwater for its entire service life. It should not be exposed to the air while operating or it will be damaged by overheating. 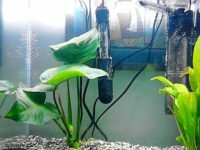 Where is the best place to put an aquarium heater? Do not place the heater in a place where it is touched by anything. The heater tube must be fully exposed to the water around it. This prevents hot spots from building up and weakening the glass where a rock or ornament prevents the even distribution of heat off the glass. The same applies to burying the heater in the gravel – Don’t do it! The thermal conduction of the heat is disrupted and the tube will burst form the uneven distribution of heat. The heater should be placed as directly in the filter flow as possible. Make sure the output water flow from the filter is thoroughly mixing the water and keep it moving at all times. This allows the heat to be pulled from the heater tube and evenly distributed around the tank as a whole. Proper current from the filter will also prevent thermal layering from occurring. One trick I have found is that the heaters seem to be more accurate if they are placed on a slight diagonal rather then vertical. Why? I really have no idea. But straight up is less accurate than a ten-degree angle with the top off the center of the heater element. When installing a submersible aquarium heater, it important to remember that they do need time to acclimate to the ambient water temperature. A heater should be placed in the aquarium for about 30 minutes before power is applied. This gives the new heater ample time to adjust to the surrounding water temperature. Most heaters have an indicator light integrated into the unit that lights whenever the heater is actually operating. 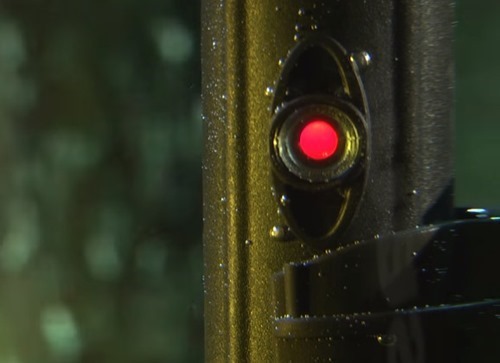 When the indicator light is on, the heater is heating the water; when the light is off, the heater temporarily stops its work because the temperature in the tank has reached the set one. Depending on the actual room temperature and how well the aquarium can keep the heat, the heater may run all the time or very little. This is the reason why your aquarium should be covered with a canopy to prevent both evaporation and heat loss. Never trust the heater calibration, you should always have a reliable independent thermometer to verify the temperature in the tank. Checking the temperature of the aquarium water once a day is an important part of your regular aquarium maintenance. I always put my hand on the side of the tank when I verify the temperature. Over time I have come to know the temperature “by hand”. I usually know if there is something wrong before I even look at the thermometer.